Students may contact Bushur at mjb6337@truman.edu for questions or more information. Admission is free. Tickets are available for students with a Truman ID and for the general public in the Student Activities Board Office, located in the lower level of the Student Union Building. To apply, send a résumé, two writing samples and contact information for two on-campus references to the Public Relations Office, McClain Hall 202 no later than Nov. 1. For questions about the internship, contact Travis Miles at tmiles@truman.edu. As of Oct. 16, the Truman community has contributed more than $26,000 to the Truman United Way Campaign, representing 45 percent of the University’s $54,000 goal. To make a donation, contact Pam Ryan at pjryan@truman.edu or Maggie Herron at mherron@truman.edu for a pledge form. Oct. 23-27 has been dedicated to raising awareness of the Wellness Zone, located in Pickler Memorial Library. The Wellness Zone provides students an area on campus where they can learn stress management and relaxation techniques. There will be events throughout campus to raise awareness about the Wellness Zone. From 10:30 a.m.-3 p.m. Oct. 23 in the Student Union Building, McClain, Ryle and on the Quad, students can grab free trail mix to kick off Wellness Zone Awareness Week. A presentation about nutrition will take place from 7-8 p.m. Oct. 24 in Violette Hall 1144. The captain of Illusion Danz team will lead a free hip hop workout class from 6-7 p.m. Oct. 25 in the Rec Center Aerobics Room. Students should bring their Truman ID and an extra pair of shoes. From 5-8 p.m. Oct. 26 in Ryle hall, students can attend a free cooking class in Ryle Hall and get hands on experience with food preparation, cooking and portion size. The dinner will consist of chicken tacos. There will be another cooking class in Missouri Hall from 5-8 p.m. Oct. 27. Afterwards, there will be an open house in the Wellness Zone, located in Pickler Memorial Library 108. Free massages will be provided. For more information, contact Tara Quintos at teq8752@truman.edu. Senior health and exercise science students are hosting events Oct. 24-25 to raise awareness of prescription drug abuse and misuse. Brenda Higgins of the Student Health Center will give a presentation on prescription drug abuse and misuse from 7-8 p.m. Oct. 24 in Violette Hall 1010. From 9 a.m.-3 p.m. Oct. 25 on the Quad there will be a table set up where students, staff, faculty and community members can drop off their leftover prescription medications. The table will be supervised by a police officer, and all medications will be disposed of safely. It is requested that no illegal drugs be brought to the table. Following the take back event, students enrolled in Health 270 will give presentations all over campus about the dangers of prescription drugs. For more information, contact Jessica Swiniarski at jswini422@gmail.com. Many Truman organizations have planned activities and events around the campus and community to celebrate Halloween. Sigma Alpha is hosting their annual haunted corn maze fundraiser from 7-10 p.m. Oct. 24 and 8 p.m.-12 a.m. Oct. 25-26 at the University Farm. Admission is $3 with a Truman ID and $5 for general admission. On Oct. 24 a $1 discount will be given to those who donate a canned food item. From 1-3 p.m. Oct. 27 the corn maze will host a Kid’s Day. Instead of scary things, the kids can participate in crafts and scavenger hunt and enjoy the day. Admission is $3 per child. The House of Grim Haunted House will be 7:30 p.m.-12 a.m. Oct. 25 and Oct. 31 and 7:30-10:30 p.m. Oct. 26 in Grim Hall. Join the staff for a haunted house experience while learning about the history of Ezra C. Grim Hall. Admission is $3. This event will be scary and should not be attended by young children. BNB’s Greatest Scare on Earth Haunted House will be from 8 p.m.-12 a.m. Oct. 25-26 and 8-10:30 p.m. Oct. 27 in the BNB Hall Basement. Admission is $3, and $2 of the admission price will be donated to Doctors without Borders. For more information, email kmb5543@truman.edu. This event will be scary and should not be attended by young children. IPAC Presents: Haunted Baldwin will be 7-10 p.m. Oct. 26 in Baldwin Hall’s basement. Tours start underneath the Baldwin/McClain bridge. Trick-or-Treating for Canned Goods will be from 3-7 p.m. Oct. 28. Students will meet on the Quad and go around Kirksville in costumes to collect canned goods as part of the Big Week of Giving. For more information, email trumanserve@gmail.com. On Halloween night, the residence halls will be open from 6-8 p.m. for trick-or-treating for children of all ages. For more information on these events, visit calendar.truman.edu. Sigma Lambda Gamma is hosting a Bolivian Fair Trade Sale at 8 a.m. Oct. 21 on the Student Union Building Mall. Wool scarves, hats, sweaters, gloves and more will be on sale, and all proceeds go back to the families in Bolivia who made the clothing. For more information, email Jacey Wood at jacey@truman.edu. Dr. Timothy Moore, author of “Music in Roman Comedy,” will speak about the performances of some of the world’s earliest comedies at 7 p.m. Oct. 21 in Ophelia Parrish 2210. Moore is the John and Penelope Biggs Distinguished Professor of Classics and chair of the Department of Classics at Washington University in St. Louis. The event is sponsored by the Department of Classical and Modern Languages. Students that submit an application form and deposit to study abroad in Switzerland by Oct. 22 are qualified for a free round-trip ticket to Lugano, Switzerland for the spring 2014 semester. For more information, visit the Study Abroad Office. The newly formed Tree Campus USA committee, in conjunction with ECO, will host a tree planting ceremony as part of an Arbor Day. The tree planting will take place on the east side of the Quad, north of the center walk, by Ophelia Parrish. This will be a ceremonial planting of an American Linden/American Basswood tree. Francisco Cerezo is a human rights activist who works with Witness for Peace Organization to promote human rights across the globe. His story includes personal narrative about his three brothers who were arrested and held as political prisoners. The event is sponsored by the Global Issues Colloquium Committee. The Truman State University 24th Annual Undergraduate Philosophy and Religion Conference, sponsored by the Department of Philosophy and Religion, will take place from 9 a.m.-5 p.m. Nov. 9 in the Alumni Room of the Student Union Building. Keynote speaker Dr. Evan Williams will present on the topic, “Can Environmental Damage be Both Morally Permissible, and Morally Bad?” This presentation will take place at 12:30 p.m. in the Student Union Building Georgian Room B and lunch will be provided. For more information, contact Kara Boschert at kbd2635@truman.edu or David Murphy at 660.785.7246 or dgmurphy@truman.edu. Pickler Memorial Library will now open at 11 a.m. on Sundays through the remainder of the academic year while school is in session. This is a change from the previous opening time of 1 p.m. on Sundays. The earlier opening is made possible with funds from the student iTech fee, which was introduced this year to support improvements to campus technology and library collections and services. Winner of American Idol’s 11th season, Phillip Phillips’ blend of rare authenticity and massive pop appeal has pushed him into stardom. Some of his biggest singles include “Home” and “Gone, Gone, Gone.” Tickets are available now in the Student Activities Board Office in the lower level of the Student Union Building and are $5 for students and $15 for general admission. Bob Mielke, professor of English, will release his book titled, “Adventures in Avant-Pop.” The book is the culmination of Mielke’s knowledge, interest and dedication to the work and lives of seven artists. In his book he attempts to find common ground between the different musicians. Truman’s Academic Competition Organization fielded two teams Oct. 5 at the Michigan Fall Tournament at Washington University. The A team of Jacob O’Rourke, Dylan Becraft, Nick Jones and Selena Montes tied for fourth with a 7-4 record, while the B team of Gabriel Hotz, James Fisher, Houston Roberts and Robyn Allwood tied for 10th with a 3-7 record. Individually, O’Rourke placed seventh after the preliminary rounds. Statistics from the event can be found at hsquizbowl.org/db/tournaments/1602/stats/combined. Members of Truman’s chapter of Cardinal Key attended their national conference Oct. 5-8 in Chicago. Morgan Schmitz, Lara Redmond, Shelby Pieper and advisor Liz Jorn attended workshops on fundraising, the Juvenile Diabetes Research Foundation, recruitment, reports and social media. Attendees also volunteered at the Ron Santo Walk to Cure Diabetes, which had more than 7,000 walkers and raised more than $1.1 million. Also in attendance were Truman alumni, which included Devin Lammy (National Co-Director), Rachel Marx, Kirsten Vollmer, Baillie Cloyd and Gretchen Smiles. On the last day of the conference, elections took place for new national officers and there was a closing banquet celebrating the accomplishments of all Cardinal Key chapters. Pieper was voted in as the new national president and Schmitz as national vice president. 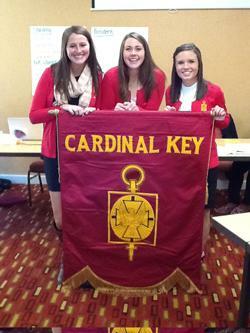 Members of Cardinal Key at the national convention. Catherine Calderon will screen her film “Dancing with the Spirits” at 7 p.m. Oct. 21 in Violette Hall 1000. “Dancing with the Spirits” tells the story of Calderon’s initiation into the Yoruba Orisha religious tradition. The film is free and sponsored by the Department of Philosophy and Religion, Film Studies Minor and the Office of Interdisciplinary Studies. For more information on the film and film-maker, including a trailer, visit dancingwiththespirits.com. The University Art Gallery will have a public reception at 6 p.m. Oct. 22 to celebrate the opening of the Art Gallery exhibitions “An Illustrated Life: A Retrospective of the Life and Works of David Grove,” and “Disasters of War: New Prints by Nick Naughton.” Refreshments will be served. The Stargazers Astronomy Club will host an Observatory Open House from 8-10 p.m. Oct. 25 at the University Farm. For more information, email rah2737@truman.edu. GlobeMed is hosting Dance ‘til Dawn from 8 p.m.-8 a.m. Oct. 26 in Pershing Arena. Dance ‘til Dawn is a fundraiser where teams of 12-16 dance constantly. Each team must raise a minimum of $200 to register. The team that raises the most money receives 10 percent of the total profit earned to go to the philanthropy of their choice. For more information, email ocl2326@truman.edu or enm4644@truman.edu. The Sweet Expressions Kettle Corn Sale will be from 2-5 p.m. Oct. 30 on the Quad. As part of the Big Week of Giving, the SERVE Center will be selling black and orange kettle corn from Sweet Expressions.